"Overall, the combination of D-Fraction and Vitamin C was highly potent, inducing >90% growth reduction in nearly all cancer cells except for a 70% growth reduction in lung cancer A549 cells." Both Ascorbic Acid and D'Fraction encapsulated in sunflower-based 150 nanometer liposomes. "Sensuke Konno, et. al. discovered that at the right concentration, Vitamin C and D'Fraction together become highly toxic (in vitro) to cancer cells. This discovery was made by conventional cancer researchers, almost by accident. Amazingly, both vitamin C and D'Fraction are non-toxic and beneficial to our healthy cells. I was just told by my friend that the guy he gave the Conquer to is getting better and the man's oncologists are floored. Heck, I'm floored, too. He is a 50 something Hispanic male with stage 3 pancreatic cancer and no clue about alternative medicine. The fellow works with his daughter and gave him a bottle of Conquer 2 months ago as a "Hail Mary". He's had 2 more bottles, so that's approx 1 bottle every 2 weeks. (I'll get the exact amount and details soon.) The tumor is shrinking FAST. The docs said "It's like something is eating the cancer..." they have NEVER seen anything like it. The ONLY therapy the guy is taking is the Conquer and some powder and Lypo C and he knew nothing about it and the fellow hadn't sold it as a miracle or anything, so there is no placebo effect. My name is Rob [deleted] and I have been an auto ship customer for about 3 years. I left you all a voice mail this morning about a family member diagnosed with terminal liver cancer in Nov 2016. After about 40 days of detox and liver cleansing as well as Vitamin Shoppe oils such as oregano oil, turmeric, dandelion root, garlic, vitamin d3, and your vitamin c powder, bought a bottle of Conquer right before the CT scan. On day 1, he took two servings. The scan results blew the MD Anderson specialist away. The first thing he asked when he walked in the room was, "what treatment are doing at home?" Not only is the tumor (6cm) stabilized but the protein marker they use to measure growth indicates the tumor is shrinking. We never did tell what we were doing but the doctor was very impressed. For the second bottle, he has taken 3 servings at one time 3 times per day for a total of 9 servings in one day. I realize this is not scientific but we are willing to provide before and after documentation as well as a notarized attestation to the protocol we used. Of course, a testimonial is without question. I can also post the information on the forum board. The next CT scan and blood work is in 3 months. Can we order more Conquer as well as Vitamin C powder, and is there any volume discount? More Conquer reports at our cancer forum. 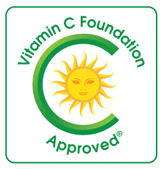 Ordering the World's Finest liposomal D'Fraction/C from INTELIGENT*Vitamin*C Inc supports the Vitamin C Foundation. China-FREE™ Liposomal Vitamin C is guaranteed not to contain vitamin C that is made in China.